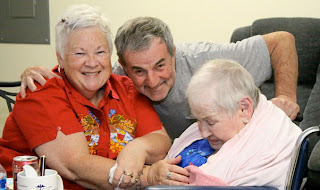 Family Matters Especially when Caring for an Aging Parent. Family caregivers take over various responsibilities for their elders. It may be just handling finances, running errands, going to doctor appointments or taking on full 24 hour care services. In most cases one sibling in the family will become the main caregiver, but most successful ventures are supported by the entire family. There is a saying that it takes a village to raise a child. This may be true, but it takes a family to care for an aging parent. As seniors lose physical and cognitive function they become vulnerable and unable to manage their own care. Who better to know their needs and desires than their own children. Even if professional care givers are providing services, family involvement makes the difference in quality of life for their parents. Experience has shown that even families that are close can quickly grow angry, jealous and hostile towards each other when an aging parent begins to need long term care. If a sibling moves into the parent’s home, others can easily be suspicious of ulterior motives and fear to lose their inheritance. On the other hand, the child doing the entire care taking becomes bitter and feels there is no support or help from siblings. One example of a family misunderstanding is that of a brother accusing his sister of stealing all of the money from the sale of his parent’s home. Karen, who was a single mom with two children, moved in with her parents when her father had a stroke to help her mother take care of him. Her mother was also disabled. Needing money to pay for a home care service, Karen helped her mother do a reverse mortgage on the home, which gave the needed funds. If communication had been open and Karen’s brother had known the need and been involved with his parents care, he would not have reacted so negatively when he eventually found out about the reverse mortgage. Every family is different. Some families are close and some have never been compatible. If your communication is strained, consider having a professional mediator such as a Geriatric Care Manager or Professional Patient Care Advocate present at a family meeting. The mediator will be able to keep things calm and running smoothly and help work out each persons concern. Family matters. The experience of working together for their parents care can give aging parents and family members a peaceful, memorable experience. Call Family Caregivers Network 215-541-9030 or visit www.familycaregiversnetwork.com for more information or to schedule a visit by a Geriatric Care Manager or Professional Patient Advocate. Article compliments of The National Care Planning Council which Family Caregivers Network is a member of. Multiple resource information available at Long Term Care Link. New Mobile GPS Medic Alert Systems are for aging individuals on the move. with Dene Liott live on "What's Happening"
Get Help wherever you are with the new Mobile Alert GPS system. Now you can go out and participate in all of your favorite activities - taking walks, gardening, lunching with friends or traveling - and still be able to get help in the event of a sudden fall or medical emergency. MobileAlert, the medical alarm service that uses GPS technology to follow you at home and on the go, ensures that professional help is your constant companion. 1 out of 3 Americans age 65 and older fall at least once a year. Chances of surviving a fall are 6 times greater if you're found within the hour. Check out the new technology today at "Medical Alert"